Enjoy Paso Prime anywhere now shipping direct. 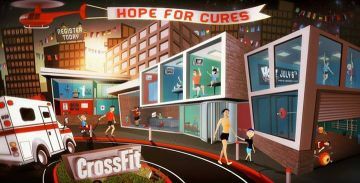 See what CrossFit is all about! Open to alll CrossFitters and the community. Work Out Of The Day: 10am-12pm. There will be prizes for top 3 male and female finishers. Great BBQ and drinks to follow. Join us along with acclaimed Chef Josiah Citrin for Pier Del Sol this Sunday October 14, 2012 from 10 a.m. – 2 p.m. at the Santa Monica Pier in support of Special Olympics Southern California. Come out and enjoy fantastic food from fabulous chefs in one of California’s most exciting locations. Pier del Sol is a family fun extravaganza where guests can enjoy an amazing outdoor brunch prepared by more than 35 of LA's top restaurants, unlimited rides and games at Pacific Park, and live entertainment. This year's event will also feature chili and apple pie contests, karaoke, arts and crafts, a Prize Drawing Extravaganza, a tide pool, and many more activities. Paso Prime makes it's Northern California culinary debut at Epic Roast House on the Embarcadero in San Francisco with a very special menu by renowned chef Jan Birnbaum. Paso Prime California raised grass fed beef is elegantly paired with estate show pieces from Staglin Family Vineyards, Madrigal Vineyards, and Domaine Carneros. Paso Prime Co-Founder Guido Campellone expressed enthusiastically that "Chef Jan's creativity promises to amaze us all" in a recent interview. This exclusive, invitation only event, hosts 50 of San Francisco's top culinary talents acquainting them with the agricultural excellence rising out of the Central Coast known as Paso Prime. Join us in Trinidad and Tobago as The Paso Prime Beef Cycling Team returns to defend its title at the Tour of Tobago. Come out and cheer our team on to victory. Look for us on ESPN! Join us in Trinidad and Tobago as The Paso Prime Beef Cycling Team returns to defend its title at the Tour of Guyana. Come out and cheer our team on to victory. Look for us on ESPN! Join us in Trinidad and Tobago as The Paso Prime Beef Cycling Team returns to defend its title at the Newsday Classic. Come out and cheer our team on to victory. Look for us on ESPN! Find a restaurant, grocery store, or butcher shop featuring Paso Prime near you.